VL Rojo Bueno 4/115 is quite possibly the best producing son of 3X MaxiMillionaire 56/3. His dam, VL Elena 23/4, is one of our favorites and most consistent producing donors ever. She is very clean in her lines, and is a maternal award-winning cow with an excellent udder and very desirable teats. She boasts an MPPA number of 109.9%. VL 4/115 will impress you with his tremendously long, flat hip, heavy hind quarter, and desirable feet and legs, a trait strongly identified with the entire Santa Elena herd. 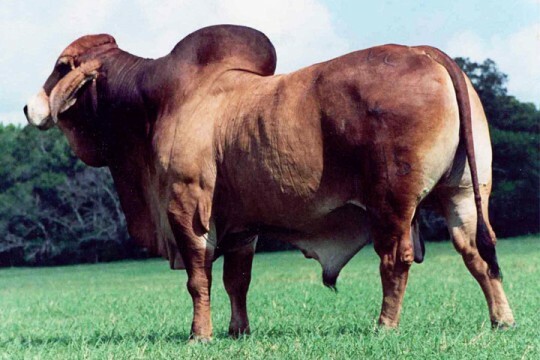 His calves rise to the top weaning weight and exhibit the same outstanding muscle structure as 4/115. His numbers show an 85 pound birth weight, 575 weaning and 925 yearling. At maturity, he weighed in at 2,475 pounds and 65.5 inches tall. Sire of a National Grand Champion Brahman Cow. 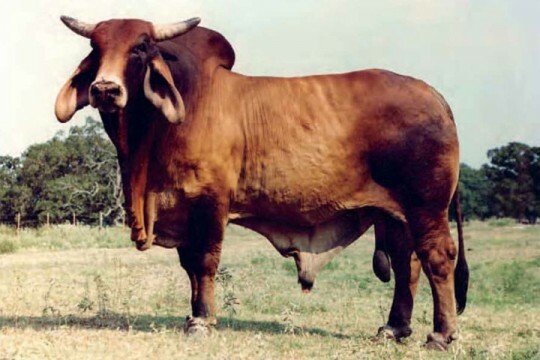 We feel 4/115 should be used on solid red cows with medium to large frame size. He will add muscle, bone, and breed characteristics while improving udder and teats on the females. Plus he will clean up the underlines and add power in the hindquarter.